Comment: Both the main page as well as the subpages! Snow White is the lone white stone in the middle. The black stones constitute the dark woods. Snow White can make two steps each time (White makes two moves per turn) while one extra tree grows each time (Black makes one move per turn). No trees can grow outside the woods. 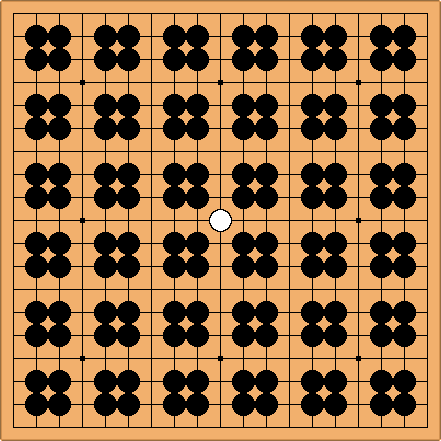 Snow White must try to escape (White to make a chain reaching one of the points outside the square formed by the black stones). At first sight it seems impossible, until one thinks of miai. The exercise was presented as an alternative to AtariGo as teaching method. What do you think of Atari Go Teaching Method ? Arno: no, you're not allowed to put a tree (black stone) on the fourth line (No trees can grow outside the woods). Indeed, once you know enough to play miai, the problem is easily solved. Why? I think if White starts, White can escape even if trees on the fourth line are allowed. 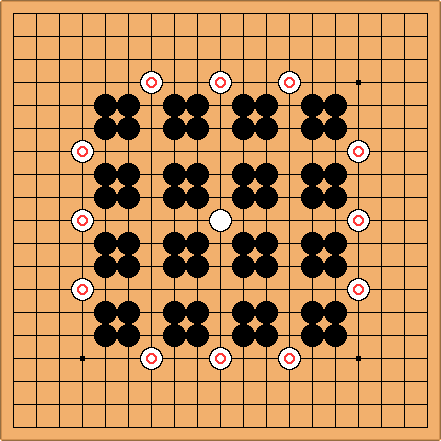 The white stone in the center must connect to one of the marked white stones to win. 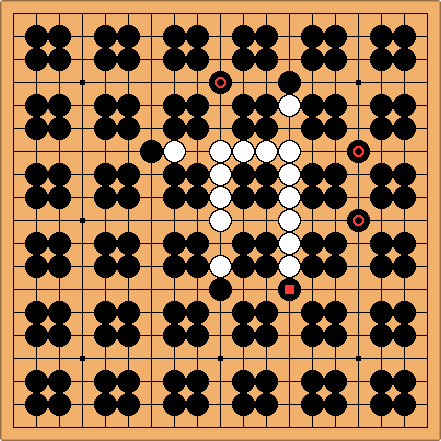 This diagram makes the actual solution jibe with weiqi intuition a bit better. I tried to solve this problem, but first I misunderstood the rules. By this way I found a new variant of this problem. In the actuall problem white has won, if white comes to the fourth line. My new rule is: White has to put the last stone on the fourth line. The last stone has to be one of the marked stone in the upper diagram. 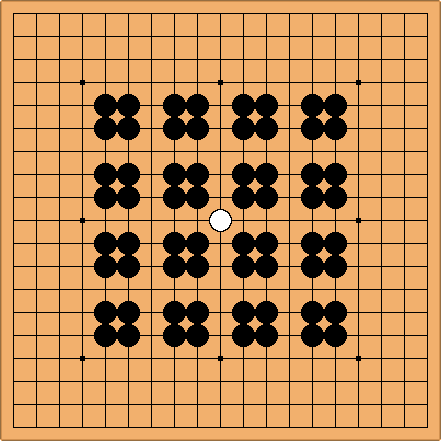 Bill: Does your strategy work if Black, unless otherwise forced, plays on the points? This will work against your strategy for Black, Bill. Bill: White gets to the fourth line? Is there a similar solution when larger woods are used? posetcay: I tested out and it doesnt seem to work when black tries to capture in large scale. Black's marked stones on the 4th line are used more effectively in this variation, pushing white into a dead end.